Re: The Alan Moore thread (all things bearded and be-ringed! The only title of this mess that I can imagine reading is Minutemen. The others interest me not at all. And that Comedian cover with his cigar hanging out of the mouth zipper is downright obscene. For one thing, he doesn't wear a freaking gimp mask in the comic. Listen, Alan was overly harsh when dismissing the creators involved in BEFORE WATCHMEN. I mean, saying that this is their only chance to be involved with something that the mainstream recognize? I don't know about that. I mean, Darwyn Cooke has New Frontier, which was a successful animated film. He is also doing the Parker GNs, which are widely known. Azzarello created 100 Bullets, which is a successful indie book that has nearly been made into a TV show. I think he is selling those guys short. On the other hand, I recognize his frustration. I think perhaps his attempts to distinguish his work on LoEG and Lost Girls is a little disingenuous, but I don't begrudge him his bitterness. None of us has any idea what was going on at the time, but if it truly was Moore's understanding that they were to own the rights, it is entirely understandable why he would be pissed. At some point, creators need to get behind each other so that these kinds of things become less frequent. And for a group of high profile creators to so willingly aid DC in exploiting Moore's creation against his wishes, as he sees it, well that would piss any of them off were they in his position. Anyway, this was always going to be a thorny issue. The irony is, I think Moore's continuing to add fuel to the fire will only cause more people to buy it. I think the artists and writers of Before Watchmen are being disingenuous when it comes to their feelings about Moore's owning the rights to the original book. My guess is that plenty of these creators would have backed Siegel and Shuster in their fight against DC, or Jack Kirby's battle for rights and credit on his Marvel characters. What's the difference between those situations and Moore's, except that Moore was promised outright the ownership of his work? As for whether Watchmen shouldn't be followed because it was so great ... it was, wasn't it? It shares the apex of superhero comics with a handful of other works. Alan Moore shares the apex of mainstream comics writing with a handful of other writers. His casual writings are better than the finest comics many other writers will produce. His ripoff of E.T., written on order from the editor of 2000 A.D., is arguably better than E.T. itself. His work-for-hire on Swamp Thing and Superman produced stories that, once again, sit at the peak of those characters. The man ground out quickie Image stories to feed his family that are better than the work of hundreds (thousands?) of writers who gave their all to make what they hoped would be great comics. 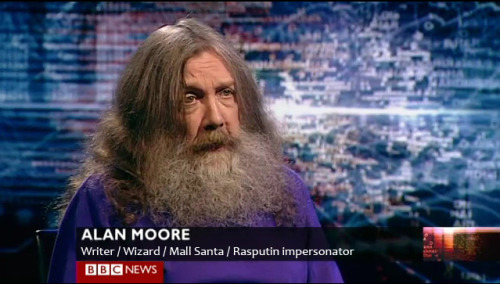 If I defend Alan Moore against his detractors, it's because he deserves to be defended. Looks much closer to the film costume than Dave Gibbons's design. That's too bad, because that was really unusual. NYCC 2011: Creator-Owned With ROBERT KIRKMAN LIVE! "One night, Erik Larsen was out with us and he said "this is what I'd do with Supreme"
So... Erik Larsen is illustrating the last issues of Alan Moore's Supreme, and then is going to jump on and continue the story. The legendary Supreme returns! ALAN MOORE's final SUPREME tale is the ultimate jumping on point for new readers! The triumphant return of Image Comics' most powerful hero! As Supreme romances Diana Dane he takes her on a tour of the Citadel Supreme and tells all of his innermost secrets just as Supreme's most hated nemesis, Darius Dax, makes a most unfortunate discovery: the key to defeat his abhorred adversary! It's most mind-blowing cliffhanger in the history of comics! Featuring a story by award winning author ALAN MOORE (WATCHMEN) and art by fan favorites ERIK LARSEN (SPIDER-MAN, SAVAGE DRAGON) & CORY HAMSCHER (X-MEN). You wish all comics were this good! In his "about the author" blurbs, he used to write that "when he is old, he will look like Father Christmas's evil twin." Is Harry Potter The Antichrist In Alan Moore’s Latest Graphic Novel? A Step Nearer To Twilight Of The Superheroes? Rich Johnston wrote: I’ve run this theory before. But the evidence keeps mounting up. That, step by step, DC Comics is laying the groundwork to run Twilight Of The Superheroes, the Alan Moore pitch that they bought, lock, stock and two smoking Benson And Hedges, before Moore fell out with the company and withdrew his labour. But DC Comics owns the pitch, fair and square. You can read the whole pitch here. We’ve seen the uses of the Houses of Secrets and Mysteries, we’ve seen Superman and Wonder Woman getting it together, w’ve seen a man from the future changing his own past (Booster Gold in the Dan DiDio/Geoff Johns Justice League International Annual), we’ve even seen one destroyed future in Swamp Thing/Animal Man’s Rotworld. But John Constantine, at the centre of the Twilight Of The Superheroes story, is getting his own comic in the New 52. Originally, Twilight Of The Superheroes was intended to spin Constantine off into his own book. Could We Get A Twilight Of The Superheroes From DC Comics? However, between buying the pitch and Moore actually working on the comic, he fell out with the publisher and went on strike. Fifteen years ago, Moore gave me permission to reprint the proposal, which I was planning to do in a way designed not to infringe DC trademark or copyright. At which point, DC Comics sent their very first Cease & Desist order by e-mail, to me. On the very reasonable basis that they’d actually bought the proposal, and had paid Alan Moore in full. Something Moore then agreed that, yes, that had probably happened. So that was that. The proposal is often hosted by one site or another, until DC Comics tells them not. Right now it can be read here. There are a few, fair use extracts that may be worth mentioning. The House of Justice, built around the remains of the JLA’s old cavern headquarters, is the residence of the remains of the Justice League. These are the most important of the lesser House, along with the Titans. The lineup of the Justice League at the time of our story includes Captain Atom and the Blue Beetle, an Aqualad that has grown up to be the new Aquaman and a Wonder Girl who has taken on the mantle of Wonder Woman after Wonder Woman herself opted to become Superwoman upon marrying Superman. Yup. Superman and Wonder Woman hooking up. Constantine is about twenty years older, but obviously hasn’t changed a bit, except for the fact that he’s living with a woman and has been for the past fifteen years. This woman might even turn out to be the Fever character that I introduced in my two part Vigilante story a while back. Anyway, her and Constantine are to all intents and purposes married, and are obviously loving it. Constantine is still into the same sort of scams and wheeler-dealing, and in the whole story of Twilight he seems to be the only character who has his finger upon all the pulses and knows exactly what’s going on in this maze of plot and counterplot between the various factions involved. And then there’s that bit in Justice League International where the hooking up of Superman and Wonder Woman seems like the thing a certain Booster Gold was here to prevent happening. But now he’s too late. Wth DC Comics looking to their assets and seeing what can be exploited, and Geoff Johns with a history of talking minor plot points by Alan Moore and turning them into massive crossovers, could Twilight Of The Superheroes be rewritten, reinterpreted, but brought into service for today? Are we really sure he's only an impersonator? The Stuff that makes Watchmen radical is not really the stuff that's in the plot. It's not dark treatments of super-heroes--I mean, that had been done before. i mean you could even say that Stan Lee and Jack Kirby were going for a gritty, darker treatment of the super-heroes back in 1961 with the Fantastic Four. More shadows in the artwork, kind of depressed slum dwellings in the backgrounds, more realistic dialogue and character interaction. Briefly, what the [Dave] Elliott group intended to do was to licence Marvelman from Emotiv – rather than buy the character from them outright – and with the consent of all the other copyright holders – Moore, Leach, and so on – to produce three films based on the three books of Moore’s run on the character; to publish the three volumes of Moore’s run with new artwork, all done by a single artistic team, possibly with Garry Leach involved; to also republish the books in Moore’s run as they had originally appeared, with the original artwork; and to then go ahead and produce two new mini-series, both set in the time before Moore’s story started. DOMINIC PATTEN wrote: Captain Nemo could be coming to the small screen and he’s bringing some friends with him. FOX today gave a put pilot commitment to League of Extraordinary Gentlemen. The one-hour drama is based on comic guru Alan Moore and illustrator Kevin O’Neill’s multi-volume series featuring Nemo, Allan Quatermain, Dracula’s Mina Harker, the Invisible Man and Dr Jekyll/Mr. Hyde. The Victorian Era-based series from the Watchmen and V For Vendetta creator was first published in 1999 with subsequent volumes moving through time to the contemporary UK. Like with the 2009 Watchmen film, Moore is not involved in this project neither is O’Neill. Michael Green will serve as EP and showrunner for the 20th Century Fox TV produced project with Erwin Stoff also executive producing. Today’s announcement is not only the studio’s first major drama sale at FBC this development season but comes just under a year after the Gotham creator inked an overall deal two-year deal with 20th TV for cable and broadcast projects in co-junction with Stoff. Of course this isn’t the first adaptation of Moore’s League. 20th Century Fox put out a feature adaptation in 2003 starring Sean Connery and Jason Flemyng among others. The tepid box office response killed off any plans for a franchise. Michael Green is repped by WME, 3 Arts and attorneys Patti Felker and Bruce Gellman. I don't understand how that works. Alan Moore and Kevin O'Neill are still putting out League stories, but Fox can put out movies and TV shows based on these without dealing w/ the authors? Didn't we all already see how this works with the LOEG movie? Not good at all. They should make it into a tweener soap-opera kinda show like everything that is on the CW right now. The, Like, League of Really Boss Kids, or Whatever. Alan Moore: "I Am Not The Northampton Clown"
The author of V for Vendetta & The Watchmen refutes the rumors. Rich Johnston wrote: Marvel have made an agreement with Alan Moore to not use his name in conjunction with their reprinting of the Marvelman/Miracleman comic book, at his request. "I know that seems a long way away," admits Joe Quesada when talking about the long-awaited conclusion to Neil Gaiman's superhero storyline. Kevin O’Neill: Right now [I am working on] Alan Moore's script for Nemo: River of Ghosts is on my drawing board. It is the final book in the League/Nemo trilogy and takes place mostly in 1975. Other than saying that it has a South American setting, it would be premature to add more. Looks pretty interesting, a shame that preview didn't go further to give a full look of Berlin. And I'd really wish someone who speaks German would look over the German expressions. The 49ers made my eyes bleed at times and 'Bessersprecht' makes me fear the worst. Grab your spats and your ray gun! It's time for another volume of the League of Extraordinary Gentlemen's adventures. Hannah Means Shannon wrote: In a significant announcement landing this morning, (but which we hinted at yesterday from teases on social media), Alan Moore will be partnering with a team of creators and funding bodies to produce a digital comics app called Electricomics which will initially feature four original comics titles, and perhaps most surprisingly, an open-access platform for comics creators to develop digital comics of their own. Did Bigfoot Just Visit Britain? Watch The Video And Judge For Yourself! The creator of WATCHMEN and V FOR VENDETTA gets out while the getting's good.